London, 2 March – Hong Kong is by far the world’s most expensive city for global retailers while prime rents in major markets such as New York, Paris and London continue to reach record-breaking levels, according to new research from global property advisor CBRE Group, Inc.
CBRE’s quarterly ranking of 97 prime retail locations/markets across the globe shows that competition in the world’s leading cities is getting even stronger. This demand is being fuelled by high-end retailers willing to pay record rents for the most coveted shops, while development levels are at historic lows resulting in a shortage of prime retail space. Australia is the only country with two cities in the top 10 – with Sydney and Melbourne featuring in six and ninth places respectively. Hong Kong (US$4,334 per sq. ft. per annum) is the world’s most expensive location for prime retail rents by a substantial margin, followed by New York (US$3,300 per sq. ft. per annum), Paris (US$1,452 per sq. ft. per annum) and London (US$1,356 per sq. ft. per annum). Notably, average prime rents, as measured in local currency, posted double-digit increases in several key global markets during 2013, led by Paris, London and New York, which saw year-over-year growth of 29%, 18% and 11%, respectively, from levels that were already in the stratosphere. “There has been a lot of discussion about the strength of luxury retailers versus those that serve the mid-market. 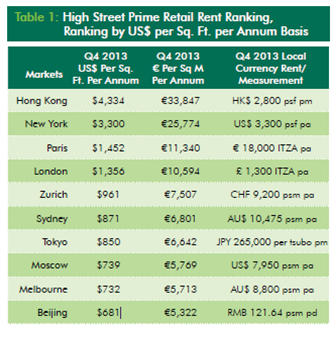 CBRE’s research provides further evidence that prime retail rents are strong in most markets and rose further in key global markets like New York, London and Tokyo. Competition for high street retail space in Sydney remains strong due to healthy demand from international retailers and limited availability. The bulk of new supply pipeline is attached to the Barangaroo office development; however, the first phase will not be completed until 2015. Australia is the only country with two cities featuring in the top ten highest retail rents with Melbourne ranked ninth. Melbourne became a hot landing spot for fast retailers during 2013, headlined by the first Australian stores of UNIQLO, H&M and Forever 21. Alistair Palmer, CBRE’s National Director of Retail Services, said that the Sydney CBD retail landscape is relatively stable with several new store openings planned for the coming months. “Martin Place has seen recent openings on Rolex and Brietling, with Brooks Brothers also coming soon. Pitt Street Mall is also undergoing a shake-up, with both Uniqlo and Forever 21 rumoured to have secured sites here,” said Mr Palmer. Retailer demand in Hong Kong is focused on prime locations rather than secondary streets. The most sought-after prime streets are Russell Street in Causeway Bay, Canton Road in Tsim Sha Tsui, and Queen’s Road Central in Central. These locations – which all recorded very tight vacancy – continue to attract both global and local retailers. New York’s Fifth Avenue continued its ascent into record territory during Q4 2013, with the luxury thoroughfare’s average asking rent rising 4.8% quarter-over-quarter to an all-time high of US$3,300 per sq. ft. per annum. For a 5,000-sq.-ft. space, that would translate to US$16.5 million per year in rent. Other prime luxury streets in the northeast U.S. also saw strong growth, including Newbury Street in Boston (up 6.7% quarter-over-quarter) and Walnut Street in Philadelphia (up 5.8% quarter-over-quarter) reporting the largest increases. The retail market in France was characterized by heavy polarisation, with substantial demand focused on prime space, especially in and around Paris. Significant interest from international retailers for the limited amount of available prime locations in Paris has resulted in steady rent growth over the past two years, with Paris’ average prime asking rent up 80% since Q1 2012. Sustained demand from international retailers will continue to support high street rents in 2014. Strong demand for prime retail pitches in London has pushed rents to record levels. The luxury sector is a huge driver of exponential rental and key money growth. The limited availability of space compared to demand for prime streets has led to increased demand for space on secondary pitches in central London. However, the UK market is heavily polarised with poorer secondary shopping centres and high streets suffering increasing levels of vacant space and falling rents. A recovery in the Japanese economy, a rebound in the stock market and anticipated growth in wages has translated into the highest consumer confidence since 2005. Big ticket items in department stores and luxury products both reported promising sales growth. Tokyo remains one of the key gateway cities for retailers that are new to Asia Pacific. With luxury brands seeking to expand and domestic retailers willing to try new locations, leasing activity has spread to peripheral areas such as the Jinnan area in Shibuya. Rental growth in Moscow high streets has remained stable throughout 2013. Demand for space remains steady, but the structure of the retail market is changing. The ratio of fashion retailers in high streets continues to decrease as the majority of Muscovites prefer purchasing clothes and footwear in shopping malls. Moscow is also set to see a significant number of new large scale shopping malls being delivered to the market. Global retailers continue to seek prime retail space in Beijing with designer brands 3.1 Phillip Lim and Cheap Monday opening their first China standalone stores. Fast fashion brands are seeking opportunities in core submarkets, while food and beverage operators are increasingly popular with shopping mall landlords, especially those in secondary locations due to their ability to attract footfall.